North of Haiti and the Dominican Republic lies a cluster of islands known as the Turks and Caicos Islands. Eight of the islands are relatively large, compared to the few dozen smaller islands in this archipelago. 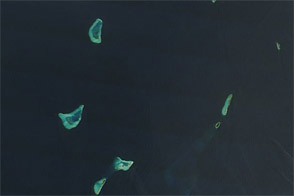 Only five of the larger islands and a few of the smaller islands support human populations, and all of these low-lying islands sit atop undersea pillars of coral. 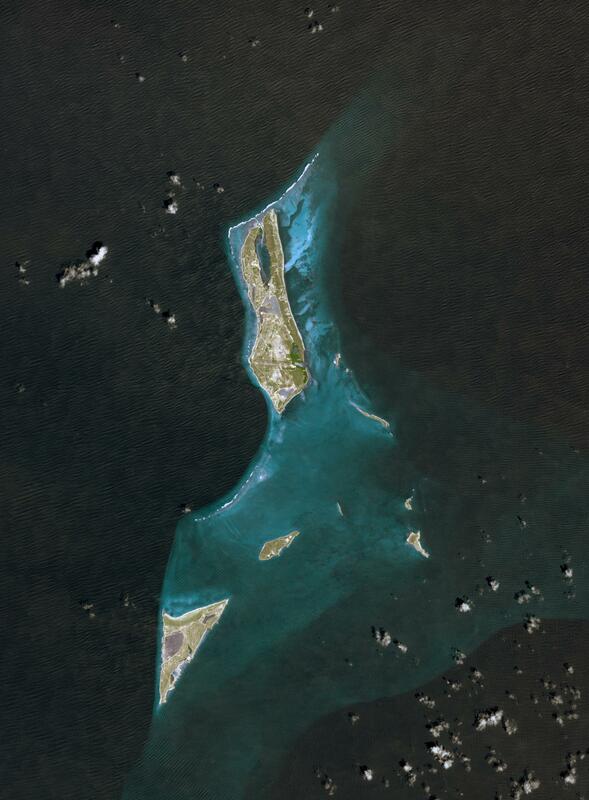 On September 18, 2001, the Advanced Spaceborne Thermal Emission and Reflection Radiometer (ASTER) on NASA’s Terra satellite captured this approximately true-color image of part of the island chain. 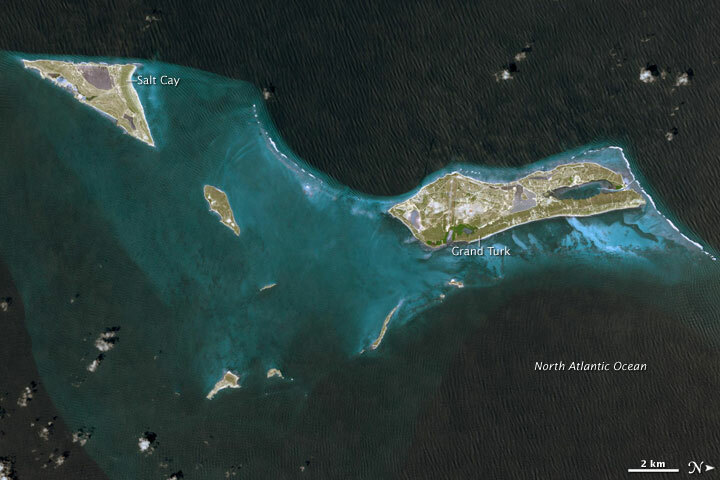 Shown here are Grand Turk, its southerly neighbor Salt Cay, and several smaller islands. (This image has been rotated so that north is on the right.) The coral surrounding the landmasses glows peacock blue, and altogether, the shape of the coral pillar resembles a giant bird in flight. The areas above water show a combination of vegetation and cityscape. Centuries before the arrival of the Spaniards, the Turks and Caicos Islands were home to an indigenous population of Taintos Indians. In the eighteenth century, salt raking began, bringing in annual influxes of workers to assist with the salt harvest. As other attempts at industrialization floundered in succeeding centuries, salt harvesting remained the local economy’s stronghold into the mid-twentieth century. NASA image courtesy of the NASA/GSFC/METI/ERSDAC/JAROS and U.S./Japan ASTER Science Team. Caption by Michon Scott. 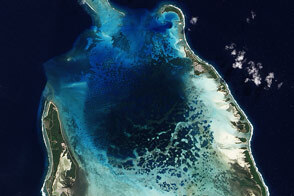 This approximately true-color image shows part of the Turks and Caicos Islands archipelago, observed September 18, 2001. LeVin, E., LeVin, D.J. (2006-2008). Geology, Ecology and Climate of the Turks and Caicos Islands and History of the Turks and Caicos Islands. Accessed April 16, 2009. ASTER. Grand Turk Island. Jet Propulsion Laboratory. Accessed April 16, 2009.